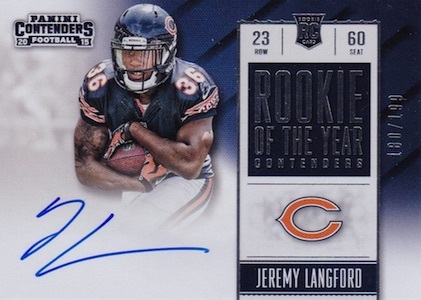 Few brands match the RC power of Contenders and 2015 Panini Contenders Football looks to continue that with a heavy dose of rookie autographs. Each box averages five autographs and includes up to two on-card signatures. 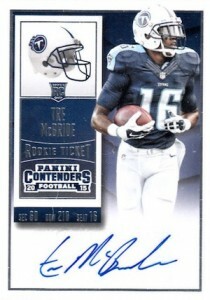 The top draw, Rookie Ticket cards utilize on-card autographs and a mix of parallels. Numbered to 199 or less, signed parallels include Playoff Tickets, Championship Tickets, Cracked Ice Tickets, Super Bowl Tickets and Printing Plates. 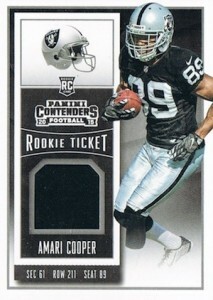 Collectors can also find limited Rookie Ticket Variations with college images. 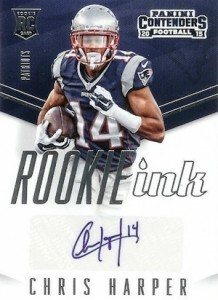 Other signed rookie content includes Rookie Ink, which also features Gold (#/25) and Holo Gold (1/1) parallels. The Round Numbers Dual Autos set documents rookies that were drafted in the same round of the 2015 NFL Draft. 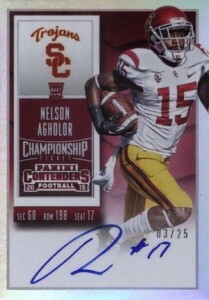 2015 Panini Contenders Football also has signed cards for current stars and former greats. MVP Contenders Autographs covers top options for the NFL MVP Award, while Legendary Contenders Autographs showcases the retired stars. 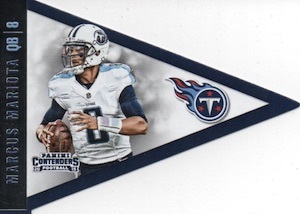 Averaging nine cards per hobby box, several inserts add to 2015 Panini Contenders Football. Pennants (1:8 packs), Rookie of the Year Contenders (1:12 packs), MVP Contenders (1:24 packs) and Legendary Contenders (1:24 packs) are a few of the choices. 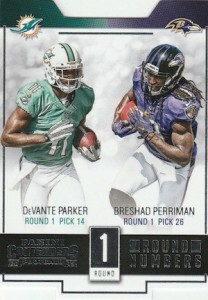 A new twist for collectors, 2015 Panini Contenders Draft Picks carries the Contenders brand name and features the 2015 rookie class, but it was issued earlier in the collecting year as a college-specific product. 147 cards. Short Prints noted below. *Card #271 is not signed. Known SP and SSP cards are noted below. 41 cards. Short prints noted below.View a full guide and gallery to the variations. 18 cards. Short Prints noted below. View a full guide and gallery to the variations. 5 cards. Short Prints noted below. 137 cards. Specific print runs noted. 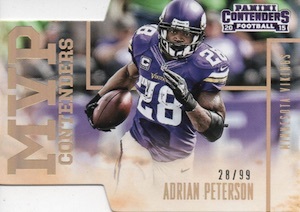 Just opened up a box of 2015 Contenders…total garbage!!! Photos- AND inserts identical to years past- brief write-up- no statistics- very poor player choice ( they have players in the set who have been out all season, ( Benjamin, Nelson) yet have not included starters from day one such as Chris Johnson for the Cardinals). Autographs are done on stickers… I got two guys who went undrafted- and are out of the league. 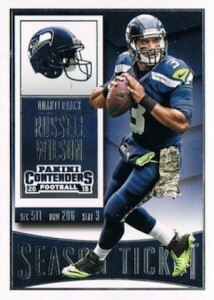 Panini manages to recycle same complete and total junk year after year…. so excited that they are controlling the football market next year! NOT! Sounds like you bough retail ^^^ you get what you pay for. Hobby is completely different. I love the idiots on here who rate a product low because the box they opened was crap. It’s gambling folks. Please stop with the stupid comments. A little disappointed I spent a good amount of money on the Panini draft picks cracked ice autos only to find out they come out with a near duplicate product a few months later? Basically devalues the earlier product. Thoughts? I’m torn with this review because I love the Contender brand and I love the card design as well as the collegiate variations and the coaches autographs are cool too, even though Chip Kelly may not agree. The one problem I have with the cards and it’s a big problem, is the condition of the cards I have pulled. 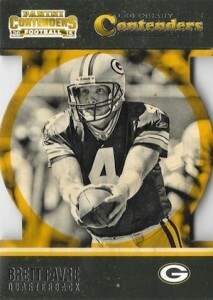 I mean, the die-cut cards have come out just completely terrible and some look like they are cut with dull scissors. I pulled one autograph with two small hairs underneath the sticker autograph and the foil on most of the cards are dinged in some way. If it was one or two, fine, but when it’s the majority of them, perhaps there needs to be better production. Phil, I’m glad you brought this up, because it is the same thought I had way back when the Collegiate cards came out. Those were all sticker autographs to the best of my knowledge and were done with last years Contender design. I thought it would devalue both products, but maybe I will be wrong. Geoff � SP = Short Print; SSP = Super Short Print. They are generic terms, but Panini will normally put a range on them that specifies the max amount. For example, in 2014: SP = 250 or less copies and SSP = 50 or less copies. We should hear specifics from Panini soon about the first patch of short prints. Unless your after a Marcus Mariota and willling to gamble to get it, you probably should just BUY the card you want from EBAY. First off, they are nice looking cards. 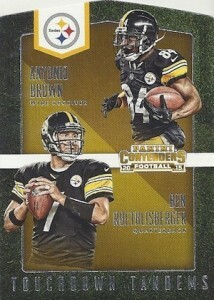 I like the layout on the cards with player and the team helmet. I bought two hobby boxes and I believe I’ve got two base sets (cards 1-100). With that said, I’m disappointed with NO rookies for a set. Maybe that’s just me that does collect sets and certain players I like. I totally misread this product. I have to say I liked the college version much more. The 12 autographed cards… Everyone one of them had boogered up lower-right corners. 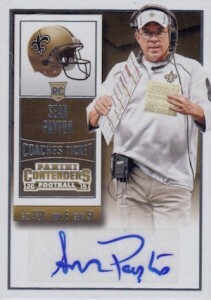 Not only that, when you sell player cards that are autographed, it’d help if they were on a NFL roster! We’re in the playoffs now and can’t create a set with players on a NFL roster this late in the season, it only started in September! 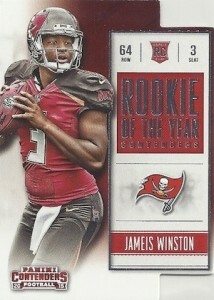 What is the difference in a Rookie Ticket Auto and a Rookie Ticket RPS? How do you tell them apart? Either one more desirable by collectors? Brian � The design is the same for both, but most of the RPS cards are signed on-card whereas the base Rookie Tickets feature sitckers. Other than that, the only difference is the checklist. RPS are generally more popular because they include the biggest rookie names from 2015.
i like the chance of getting a real good rookie auto with lasting value. Dave Richard, do you expect to get your money back each time you open a box? If that was the case, wouldn’t shop owners just open boxes and sell the cards? What happened in the base set numbering? They started with the AFC Wesr and then NFC West and so on but then totally forgot the Saints. Then at the end just threw Brees in between the Cowboys and added Sanders. You would think they would have proofed this before it went to production. I usually love Contenders, but this year, it seems your odds of pulling anyone desirable is WAYY lower than usual, or at least recent years. I’ve bought 4 boxes and each one I open is worse than the last. 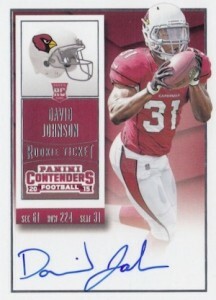 Only decent card I’ve pulled out of 4 boxes is the David Johnson RPS auto. Couple this with the fact that Panini is ignoring my requests for replacement on past years redemptions, I am not very happy with this company. If this is what we are to expect from Panini in the future, now that they have the NFL and NCAA exclusive contracts, the hobby (football) will suffer immeasurably. I am strongly considering quitting wax and just buying singles I want. I have looked everywhere and have not seen any for sale ever! 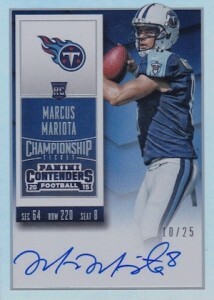 Did Panini not produce the regular auto rookie for these players? I have only seen the playoff, championship and cracked ice versions. All I can say is that I ordered a box and pulled a Jameis Winston Cracked Ice Jersey Number 3/23! I’m very happy with this product.